I can’t believe this is the last month of 2014. – I love that this product contains natural ingredients. You also can’t go wrong with a black eyeshadow to create those sultry smokey eye looks. The colour payoff for this eyeshadow really stands out as a deep black depending how much you use. – This is a nice purple colour, but I do not think I will be using this. I have way too many nail polishes! – A great way to try out this brand by receiving 4 different products to use altogether. The only thing I do not like is the packaging–foil packets are not ideal in my opinion because once you open it, you obviously can’t close it back up for later use. Yes, you can probably squeeze the contents into sample containers, but who has empty containers laying around? Not me! P.S. Do foil packets count as deluxe samples? – After reading up on this makeup remover, it seems promising. However I am not very impressed with the packaging it came in– it looks like a medicine vial! Not entirely sure I trust the contents in here. Packaging is quite important for me as a consumer so that I know what the product is and what its ingredients are. This is a very unofficial product sample with a simple sticker label. – This is a replacement product for a repeat product in last month’s box. I really appreciate Topbox sending me a replacement product, but this is yet another nail polish product to add to the pile. The colour is nice, but I have something similar and will probably not be using this. Also, seeing that I already would be receiving a nail polish in my regular Topbox, wouldn’t they realize and consider adding a totally different product?! This month’s box was not very impressive for me. 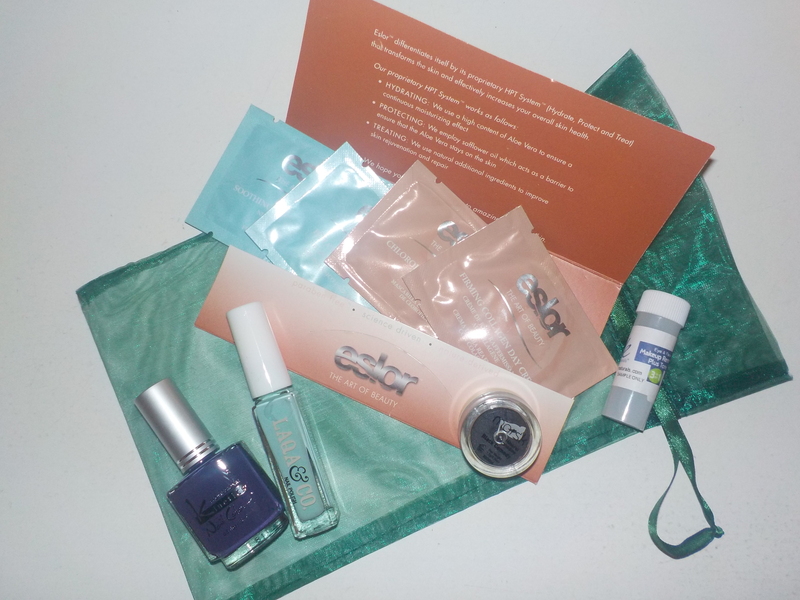 From the medicine vial looking sample to the foil packets and nail polishes, I think I will be giving these products away. I wish there was a way to opt out of receiving nail polish as I have way too many and would rather enjoy receiving other beauty products instead that I could actually use. Topbox, perhaps you can consider that in the future? Providing customers with options of what they look forward to receiving in their boxes, further catering to customer’s preferences. Just my 2 cents. What did you receive in your December Topbox? What are your thoughts? I have received Eslor through my Birchbox subscription. I am giving my skin a break before I use it and give and give a review.